Given the founder of The Crafty Pint has a soft spot for saisons, it's been rather serendipitous that La Sirène decided to build its brewery around 900m as the crow flies from the rear of Crafty Towers. It allows for fairly regular trips to the brewery, usually when there's a new beer coming out. And, pretty much without fail, once the new beer has been sampled, founder Costa Nikias can't resist pulling out samples of as-yet-unnamed beers (and sometimes things other than beers) to tease. In the past year or two, those samples have seen the La Sirène palette continue to broaden, embracing spontaneous fermentation, barrel and bottle ageing and other means of souring and adding complexity. 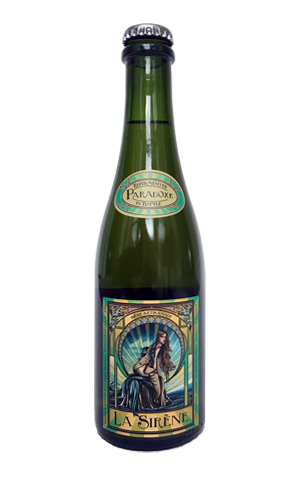 Paradoxe is a beer that has come from this experimentation, so called as it presents as much like a wine as a beer. Pale, hazy and straw in colour, it was left open to the elements surrounding the brewery, with the native bacteria helping it develop a bracing sourness and acidity – perhaps more so than any other La Sirène beer to date. There are some noticeably barnyard like elements in there, even aromas of nettle appearing alongside more expected traits, such as melon and apple. There's a hint of pale malt sweetness and a lingering touch of funk, but it's the acidity that's to the fore.